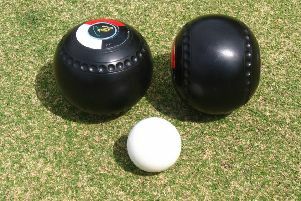 SLATEFORD bowler Robert Marshall was denied a landmark 20th club championship win as he was beaten in the final by John Ramsay. Marshall, defeated in last year’s final by good friend Gordon Ramsay (no relation to this year’s rival), had taken leads of 7-0 and 13-9 to put his opponent under pressure. But 13 is known as ‘The Boolers Graveyard’ and a six-end stay saw Ramsay enjoy a purple-patch run of 1, 1, 1, 2 2, 1 to accelerate into a 17-13 lead. Marshall escaped with a double to 15 but Ramsay had the scent of a first title triumph and found the necessary killer instinct to produce a 2, (1,1), 2 finish to win 21-17 in 22 ends. Champion Ramsay’s first reward is to represent Slateford in the Tait Trophy and the prelim-round play saw him march forward with a bye against Braid. Tonight’s first round proper pitches him against the champion of Mayfield. London Road Foundry have produced the last two Tait Trophy winners with Scott Mackintosh their hero figure on both occasions but the 2015 challenge lies in the hands of George Kyle, who launched his campaign with a 21-14 win over Bob Linton of Dean at Leith. Other results included Mark Hewitt of Whitehouse & Grange defeating his Liberton rival 21-17, Adam Davidson of Leith beating Colin Anderson of Currie 21-4, while Ian Paterson of Willowbrae walked over against Ardmillan. Meanwhile, the first-round action in the Scotmid-sponsored West Lothian Masters saw one of the top 16 seeds fall in the shape 18-year-old Connor McKendrick of Middleton Hall, the No.15 stunned by a 15-2 deficit before losing 21-15 to K Taylor of Uphall Station. Selected results (seedings in brackets): (holder, No.1 seed) Brian Craig 21, K Campbell (Mid Calder) 14; (2) Grant Logan 21, K Black (East Calder) 16; (3) Andy Dunnett 21, C Gullane (Broxburn) 8; (4) Gary Smith 21, J Aitken (Newbridge) 19; (5) John Aitken, 21; D Duff (Seafield) 8; (6) Ewan Shearer 21, A Gray (Kirkliston) 13; (7) Cameron Greer 21, S Lamb (Bellsburn) 8; (8) Alec Allan 21, S Lambie (Whitburn) 17; (9) Walter McDougall 21, J Deegan (Harrysmuir) 10; (10) Stevie Fleming 21, C Black (East Calder) 15; (11) Bryan Cooper Scr; (12) Glen King 21, C Hamilton (Queensferry) 17; (13) Richard Mark 21, F Barker (Oakbank) 12; (14) Ray Logan 21, A Paterson (Harrysmuir) 6; (16) Jordan Pearce W/O.